Discussion in 'Canon InkJet Printers' started by barfl2, Nov 4, 2018. Long time away got the 5100 error yesterday after a long trouble free period. Switched off for several hours and the error message gone. I am convinced it is connected to the paper feed arrangement because it will often feed several sheets at once. Now at complete standstill. all wireless settings OK. wired direct makes no differerence, the printer just shows error tried troubleshooter which could not find the answer. Perhaps PeterBJ might have an idea. Yes have the round dot but about 2/3" to the left is another odd shaped mark irregular in shape I can only describe it as like an egg timer but tilted about 45 degrees with jagged edges. Tried various cleaners but cannot shift it. A dirty timing strip cannot cause an intermittent error or can it?. Also notice that mikling also has experienced intermittent errors 5100. I have got a couple of MP540 with defective print heads. I'm going to dump them. They have the same timing strip that is used in the MP620, so If you would like to change the timing strip you can have one for free if you send me your postal address in a conversation. The service manual has some instructions for disassembly. I guess you already have the manual, else you find one here. the same error message. tried factory reset but no joy. It looks like the old girl has come to the end of its useful life. Just refilled it as well. I would imagine this is a software glitch somewhere. wireless connections fine. @barfl2 See this for an example of what problems a little irregular spot on a timing strip can cause. I have saved and cleaned a timing strip for you, just send me a conversation if you want it. Unhooking the timing strip was easy, I think installing it will not be. You might need to remove the scanner and probably also the sides of the casing. There is of course no guarantee that it will correct the error, but I think it is worth giving it a try. Thank you for the timing strip, very kind of you. However I have now tried fitting it twice (very tricky) but each time I switch machine on it slams to R/H end then to the other end and then shows the 5100 error message. I am wondering whether I am threading the strip through the print carriage in the correct place. Its close to the drive belt. Also for some time the Ratchet which holds the lid up does not lock in place. with the gear side cover removed there is a small white piece of plastic which clips in. And the Ratchet should sit on top, however as soon as you click the cover back it does not travel far enough and also does not signal the print carriage to come to the centre. Been using a plastic prop for some time. It looks like the old girl has had it but will keep trying. Any further suggestions appreciated. The behaviour of the printer indicates that the timing strip is not positioned properly. It must both be threaded properly through the optical reader for the strip and it must also be properly oriented. At the left hand side of the timing strip is an "L" marking. It is actually the letter "L" and must read as such. I have tried to make a couple of shots inside an MP620, but it is difficult. I hope the images show how to thread the timing strip through the print head carriage. Also see this post about another printer that is similar to the MP620. At the 6th attempt I got the timing strip in the correct place. Unfortunately the Purge unit is making horrible clicking/clanking noises, and I do not think it is cleaning the head properly. I cannot get a good Magenta nozzle check looks weak, and all attempts to print the colours are way off. I had cleaned the head, concentrated on the magenta nozzle and put a tube on the input and syringe water was flowing through in 2-3 seconds. A copy of my son on his boat shows his grey coat as green and his red lifejacket as yellow. If its the purge unit faulty,that's beyond my knowledge. Its practically a machine strip down and well outside my comfort zone. Does the printer sound like the one in this Youtube video? If so the purge unit is defective and sadly cannot be repaired. Also see this thread also about a noisy purge unit. Sadly I have no suggestions to a repair. A new purge unit and possibly also a new print head would be far more expensive than a new printer. The noise on the video is similar mine does not start up when you switch on only when the head cleaning starts. I have had like that for some time so not sure it has any bearing on the color problem. 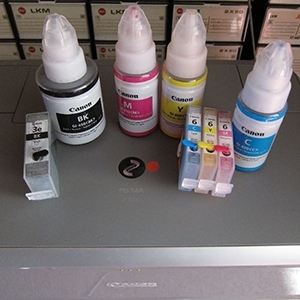 I have tried 4 different Magenta carts both types of fill method. I have had the head out and tried cleaning it. currently have a tube approx. 50mm long connected to the magenta inlet port and filled it with warm water. 35mm still in tube after 2 hours Blockage? any ideas how to shift it, or is the head blown. I have spent many hours, wasted a lot of ink and it may be right to call it a day. But what Printer ? most of the new ones are not easy to refill. Thanks again for your constant support. My 640 went the same way If you want a solid multi mode workhorse and are not primarily printing high quality photos then the Maxify range are great. You can refill the OEM'S and re-chip with ARC chips, or use ARC cartridges from Chinese suppliers. barfl2, PeterBJ and The Hat like this.